These are adorable. Love them soooo much I have a hard time parting with them but here is the deal. Ingrid B Designs just joined Face Book and she needs fans so how about we do a quick turn around give-away to show her some FB love. These are a size 4t. They will most likely be capris for most 4t's. My daughter was 18 months when she was wearing these so I had them cropped to fit her. Because of her big bottom they were not worn much because she out grew them pretty fast. I will announce a winner tomorrow May 29th. So, how can you enter this giveaway? 5) Become a fan of Ingrid B Designs on FB. 3 Entries. Just write IB to have it count. In case you are wondering why in the world you have to comment each time you blog or if you become a follower, it is because we use the number of comments to plug into the random number generator and that is how we know what number to plug in and who matches up with it - hope that makes sense. Also, if you have a blocked blogger profile please leave your e-mail address when you enter so that we can contact you. For everyone with an open profile or who we know, then you don't need to worry about that part. Good luck to you all and we will announce the winner on May 29th! Don't forget to enter my other give-away for a Zozobugbaby pattern and a creation by me! That give-away ends May 31st. i love her stuff! my favorite is her zebra apron top. love it all!!!! 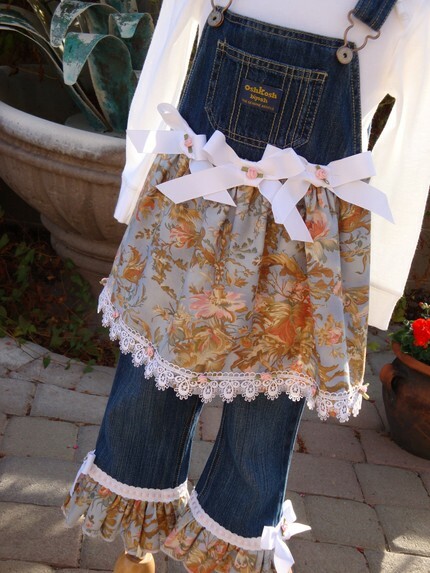 Love the custom denim ruffle capris!! She makes the sweetest things!